Habit: Annual, prostrate to erect, 0.4--2.5(4) dm, 2--8 dm diam, glabrous, glandular or hairy. Leaf: basal; blades 1--8 cm, 0.1--1.5 cm wide, linear to narrow; ocreae 0. Inflorescence: terminal, cyme-like; awns 0; peduncles 0 or erect, 0.5--3 mm; involucre bracts many, in several whorls, (1)2--4 mm, (0.3)0.5--2 mm wide, awns 0. Flower: 5--30, 0.8--1.5 mm, glabrous or minutely glandular; perianth white to rose, lobes 6, entire; stamens 3. Fruit: 1 mm, brown to deep maroon or black, obconic, glabrous; embryo curved. Habit: Plant 0.4--2.5(4) dm, 0.4--2 dm diam. Leaf: blades 1--7 cm, 0.1--0.6 cm wide. Inflorescence: branches light brown; involucre bracts 2--4 mm, 0.5--1 mm wide. Flower: 0.5--1.2 mm, generally obscured by hairs. Citation for this treatment: James L. Reveal & Thomas J. Rosatti 2012, Nemacaulis denudata var. 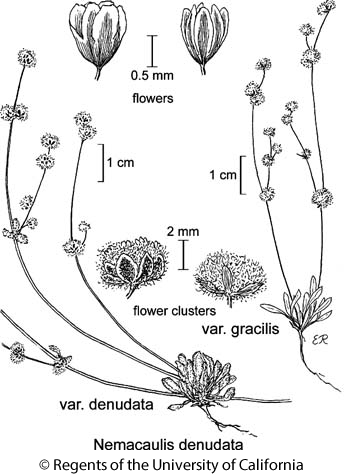 gracilis, in Jepson Flora Project (eds.) Jepson eFlora, http://ucjeps.berkeley.edu/eflora/eflora_display.php?tid=62269, accessed on April 19, 2019.